With a few simple poinsettia care tips, its easy to keep these classic holiday plants looking fantastic year after year! The poinsettia has long been the unofficial flower of the holiday season. The showy colorful leaves are perfect for decorating interiors with big bursts of color. Although red-blooming varieties are by far the most popular, they can also be found in a vast array of blooming colors ranging from white, to yellow, pink, salmon, orange and more. And in spite of being mislabeled as a deadly plant to children and pets, (more on that at the end of the article), they really are the perfect holiday plant for bringing big color inside the home. The red poinsettia is by far the most popular variety for Christmas decorating. The “blooms” of poinsettia plant are actually called bracts. Bracts are a showy set of leaves that form on top of the dark green foliage of a poinsettia. 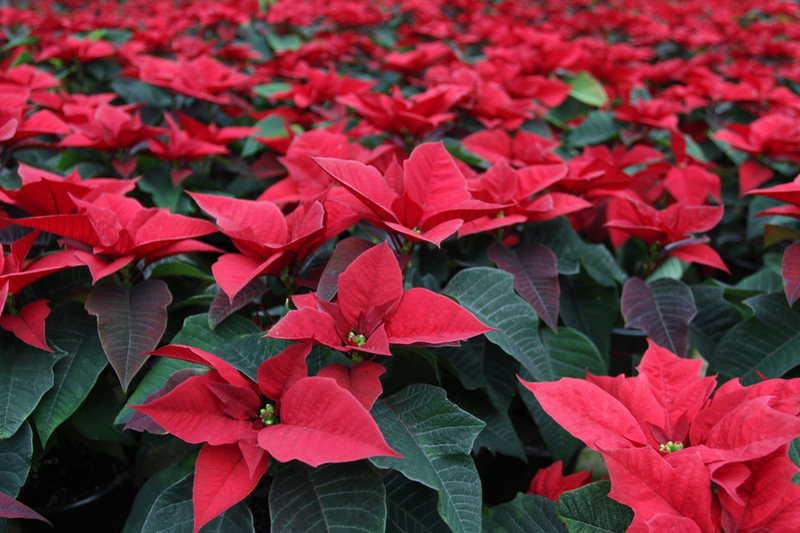 Although not a true bloom – it is these bracts that give the poinsettia plant its beautiful color. Many think of the poinsettia as an annual, and toss it to the curb after each holiday season. However, it is actually a perennial, and with a bit of basic care, can easily be kept year after year. The poinsettia actually gets it top leaf color from bracts, like these white one on this gorgeous plant. Look for plants with healthy, dark green foliage. If you want your plant to “bloom” throughout the holiday season, be sure to select a plant with bracts that are fresh and bold. The more faded or curled the top leaves are at the time of purchase, the less time it has left to stay in full color. During the holiday season, there are really only two things you need to worry about when it comes to poinsettia care. Watering and room temperature. Poinsettia plants can survive the winter near a window that can give them at least 6 hours of light a day. As with most house plants, too much water is more detrimental than too little. Keep the soil moist but not soggy. This keeps roots from becoming water-logged, which can be deadly to poinsettia plants. Most plants will hold their bracts and color well into late January and even February. Once the plant begins to fade, cut the foliage back to around three to four inches above the soil line. Don’t be alarmed, your plant will not look very healthy at this point. Perhaps more like a Charlie Brown Christmas tree than a healthy poinsettia plant – but all is well. Place the plant near a window, and within a few weeks, you will see new growth begin to appear. When spring arrives, you can move your plant to the great outdoors. Plants can be planted into the ground, but you will need to dig them back up in late summer. Poinsettia plants need 14 hours of darkness per day for about 6 weeks to from their beautiful color. For many, it is far easier to keep in pots to keep them mobile. You will want to prune back your poinsettia plant a few times to keep the growth bushy and strong. Usually once in late April, and again around mid-August will work fine. A little bit of all-purpose fertilizer at each pruning will help the plants develop strong foliage and bracts. In order for the bracts to “bloom” – the poinsettia plant needs to be in a bit of darkness. Like 14 hours of day darkness about 6 weeks in the fall. In order to have in time for Thanksgiving – you can start this process around October 1st. A little later if you want perfect for Christmas time. This can be done by placing in a closet or completely dark area early each evening, and then bringing back out in the morning to receive light from a window. Keep the plant watered as normal. Are Poinsettia Plants Dangerous To Pets And Humans? So – back to this poisonous topic. Poinsettia plants are not as deadly as many think to pets. Although they can cause a few discomforting issues when the leaves are consumed by pets or children, they are not quite as deadly as some believe. Yes, they can make them sick to their stomach – but the symptom’s do not escalate. December 22, 2018 TIMG Comments Off on Companion Planting 101 – Why What You Plant Where Matters!